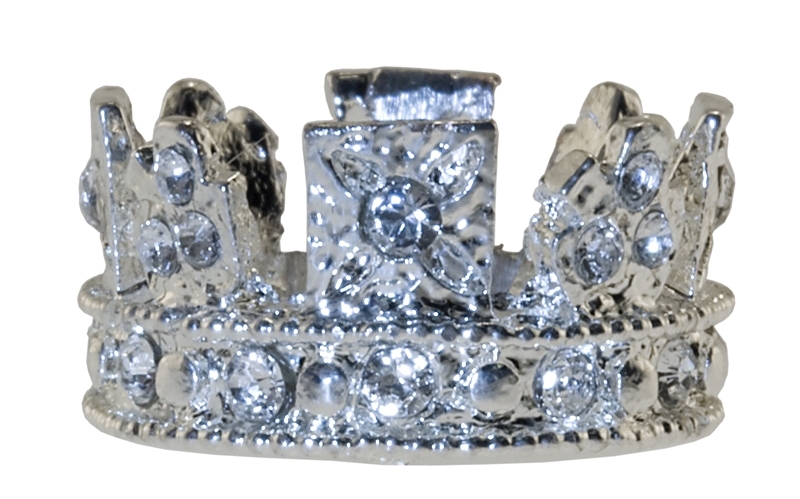 The Coronation Crown of England, St Edward's Crown, was refurbished for Charles II Coronation in 1661 from an old crown. There is conjecture that the lower half could be from Edward the Confessor's crown or, if not, that the gold might have come from it. Certainly there is no record that the jeweller was paid for the gold, which indicates that it was supplied. 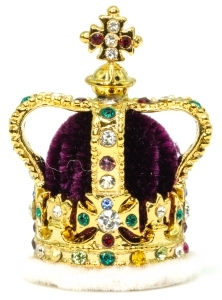 Being of solid gold, the crown is very heavy (4 pounds 2 ounces), explaining why both Queen Victoria and King Edward VII were crowned with the Imperial State Crown. 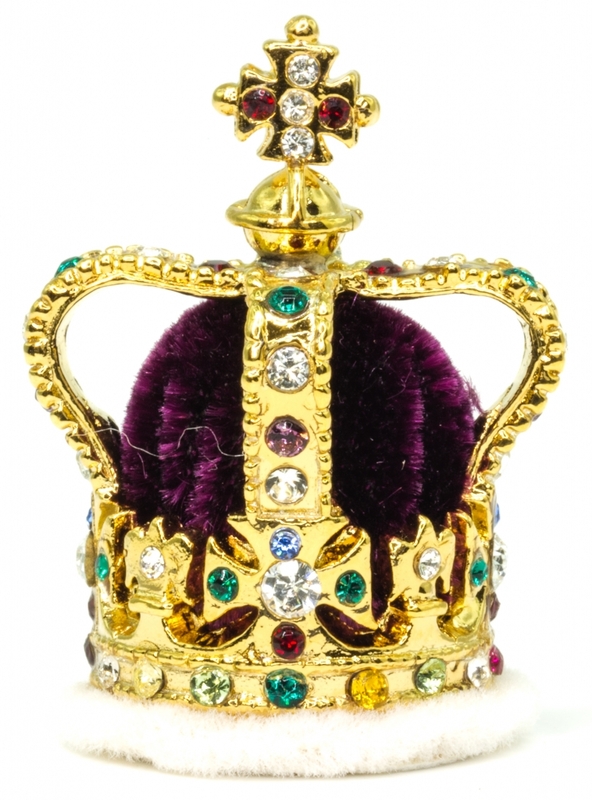 From the seventeenth to the early twentieth century the crown was usually reset with precious stones for Coronations, the jewels being hired at a cost of some 4% of their value, for King George III it was predominately set with diamonds. In 1911, for the Coronation of King George V, this practice was changed and Garrard reset it with 444 semi precious stones, of which there are sixteen large collets in the band. Of traditional English design, the crown has a circlet supporting four crosses pattee and four fleur-de-lis. From the crosses pattee rise the four half arches depressed in the centre, and at the point of intersection is the monde surmounted by a single cross pattee. It is fitted with a purple velvet Cap of Estate turned over with ermine. The best known of all the crowns, the present Imperial State Crown was originally designed and made for Queen Victoria's Coronation in 1838 by Rundell, Bridge and Rundell, the Crown Jewellers. At that time the Stuart Sapphire was in the front. The Second Star of Africa (Cullinan II) replaced the Stuart Sapphire (which was moved to the back) in 1909. This crown was used at the Coronation of King Edward VII and King George V. It was remade with practically the same stones for King George VI in 1937. For the Coronation of Queen Elizabeth II in 1953 the shapes of the arches were altered to reduce the height. 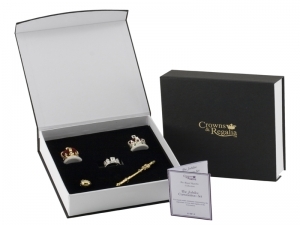 The Crown is of traditional design of crosses pattee and fleur-de-lis with four half arches of oak leaf design set with pearls and diamonds. 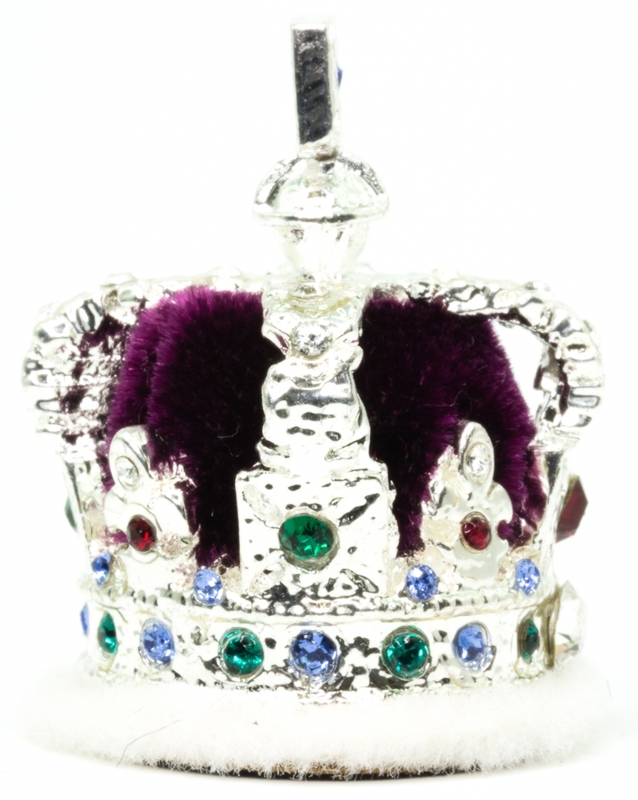 It is fitted with a purple velvet Cap of Estate turned over with ermine and is mounted in gold and silver. It weighs 2 pounds 13 ounces and is set 2,868 diamonds, 17 sapphires, 11 emeralds, 5 rubies and 273 pearls. 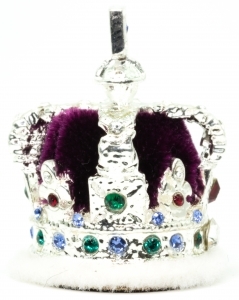 The most important of these stones are St Edward's Sapphire, set in the cross pattee above the monde, Queen Elizabeth's pearls suspended below the monde, the Black Prince's Ruby (a spinel) in the cross pattee above the band, the Second Star of Africa in the front of the band and the Stuart Sapphire in the band at the back. Apart from a Coronation, when it is worn on the return from Westminster Abbey, Queen Elizabeth II wears the Imperial State Crown for her speech at the annual State Opening of Parliament. This was made by Rundell, Bridge and Rundell for the Coronation of King George IV in 1820 to encircle the King's velvet Cap of Estate that he wore in procession to Westminster Abbey. As the Privy Council ruled that the crown could not bear roses, shamrocks and thistles, as the King wished, rather than the traditional fleur-de-lis, the national symbols were instead incorporated into the Diadem. Permanently set jewels later replaced the diamonds hired for George IV's Coronation. Queen Victoria and Queen Elizabeth II each wore the Diadem for the procession to their Coronations. The Queen also wears the Diadem when she travels to and from the State Opening of Parliament and it features on all denominational postage stamps. It is composed of four diamond pave set cross pattee alternating with four bouquets of rose, shamrock and thistle. The front cross pattee is set with a four carat canary coloured diamond. There are 1333 diamonds weighing 325.75 carats, and 169 pearls. The diamond scrollwork band was remounted for Queen Alexandra in 1902. This Orb was made after the Restoration for the Coronation of King Charles II in 1661. It is a gold hollow sphere 6.5 inches in diameter decorated with rubies, pearls, emeralds, sapphires, diamonds and an amethyst 'monde'. The Orb represents sovereign power, the cross on the top denoting Christian rule. At a Coronation it is placed in the Sovereign's right hand by the Archbishop of Canterbury before being returned to the Altar, it is later carried in procession in the Sovereign's left hand. Charles II's Orb, refurbished several times, has been used for all subsequent Coronations. The Sovereign's Sceptre with the Cross - This sceptre was made for the coronation of Charles II in 1661, and has been used at every coronation since. It was remodelled in 1910 to accommodate the First Star of Africa, the largest diamond in the world weighing in at 530 carats.